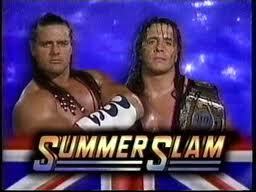 In my favorite SummerSlam match of all time, the world saw two brother-in-laws face off for the gold. Bret Hart, the current two time Intercontinental Champion defended his championship against Davey Boy Smith in Smith’s home country of England. Being accompanied down the aisle by Heavyweight boxer, Lennox Lewis, Smith was ready to rise to the occasion. This match was the first time the Intercontinental Championship would be the main event of SummerSlam, and these certainly stole the show. With Smith’s wife, Hart’s sister, Diana watching at ring side, these two put on a wrestling clinic. While they were in England and the crowd was surely behind Davey Boy, Bret had his share of fans too. During these times, Bret was making a reputation as being one of the best workers in the company. He even received more fan mail than Hulk Hogan on an occasion. MEBW: How was it sitting at ringside watching Bret and Davey wrestle at Summer Slam ‘92, knowing that the cameras were on you? MEBW:Did you know the outcome, and if so how hard was it to keep it in? MEBW: When it came to cheering , was it difficult to be unbiased? As the match continued the fans really got behind Davey Boy Smith. As Hart went for the completion of the sunset flip, Smith would drop to his knees and secure Bret’s legs for the pin. The place exploded at the conclusion of this classic as the hometown hero became the new WWE Intercontinental Champion.